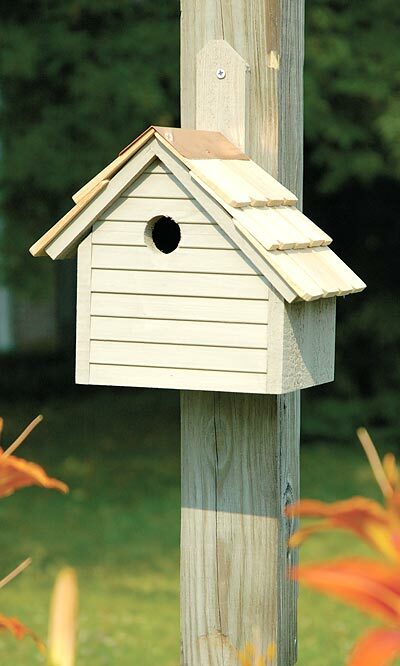 Attract wrens, chickadees, and other songbirds by installing the Heartwood Cape Cod Wren House in your birding sanctuary. The cypress shingles and copper ridge cap perfectly complement the subtle color of the wren house, and the durable cypress construction will last for years. Proper drainage combines with a convenient copper cleanout panel on the back of the house to create a sanitary, easily cleaned haven for your birds. Post mount the Cape Cod Wren House to begin enjoying your local songbirds. Handcrafted in the USA.